We know you're probably familiar with the classic solutions for your lips from Carmex. Since they are always coming up with something new, however, (like their delicious Lime Twist Carmex), we weren't at all surprised to see that they've added a skin care line to their product offerings. We gave the Healing Lotion and the Healing Cream a try this week, and the results were fantastic! First, I can't say enough about the Healing Lotion. It absorbs so quickly and leaves behind no, I repeat NO, greasy residue. You can apply the lotion and go about your business without worrying that you'll leave smudges on your iPad or your paperwork. It smells awesome, too! The Healing Cream is heavier, as it should be. It contains nine healing ingredients, and it, too doesn't feel greasy when you apply it. 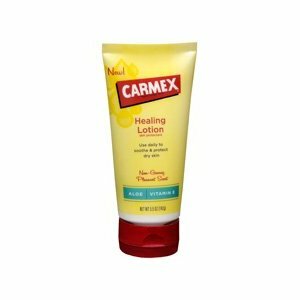 It is perfect for elbows and knees, and if you get little bumps on your arms in the winter, it's really effective at minimizing the irritation. Both products come in both a full-size 4 oz. tube, or the travel size (so you can take it on the airplane with you.) I'm not really a lotion person, so the fact that I'm in love with these two products says a lot. I want to rub it in and be done, and the Carmex line really delivers here! 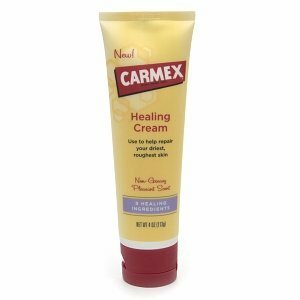 Learn more about the Carmex Skin Care Line at the Carmex website, or find it at your local Walmart and Walmart.com. Wanna Win? We're giving one lucky reader the duo of products from Carmex: Lotion and Cream! To be entered to win, just tell my why you want to win. (It's easy peasy.) You have until December 5th at 11:59pm CST to get your entries in, and the winner will be randomly selected from all complete entries. You may enter every day. (Please answer the question for the first entry. Each entry after that can be "enter me.") Open to U.S. residents 18+. * Samples and prizing was received for review. Opinions are my own.